Does the soul have parts? What kind of parts? And how do all the parts make together a whole? Many ancient, medieval and early modern philosophers discussed these questions, thus providing a mereological analysis of the soul. Their starting point was a simple observation: we tend to describe the soul of human beings by referring to different types of activities (perceiving, imagining, thinking, etc.). Each type of activity seems to be produced by a special part of the soul. But how can a simple, undivided soul have parts? Classical thinkers gave radically different answers to this question. While some claimed that there are indeed parts, thus assigning an internal complexity to the soul, others emphasized that there can only be a plurality of functions that should not be conflated with a plurality of parts. The eleven chapters reconstruct and critically examine these answers. 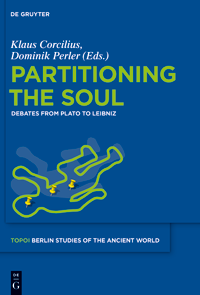 They make clear that the metaphysical structure of the soul was a crucial issue for ancient, medieval and early modern philosophers.